After an amazing and hard-fought season; the Minnesota Vikings valiantly upheld their tradition of pulling defeat from the jaws of victory, and now their stadium is going to the Superbowl this weekend! Already, the city is filled with out-of-towners ready to root for the Eagles or the Patriots and to see all of the fabulous sights Minneapolis has to offer. Of course, the biggest question on everyone’s mind, besides, who’s going to clean up all of this mess once it’s done and over, is: “What’s your favorite commercial going to be?” The second biggest question is: What are you going to serve at your Superbowl party? 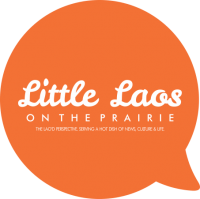 Our mad scientists at the Little Laos on the Prairie test kitchens have you covered with an homage to that quintessential Philadelphia delicacy, the cheesesteak, and Minnesota’s own notorious Jucy Lucy, or, as we’re naturally going to call it, the Jucy Laocy. We know this one’s going to be a savory hit, being reasonably easy to prepare, as well as customizable to your family’s own Lao American tastes. Heck, our very own Donna Luangmany found out about it only minutes before preparing it at home! You can count on us to deliver the goods, for sure. We estimate this to be about 15 minutes of prep time and 10 minutes of cooking, or about a half-hour if you’re starting from scratch. Donna has 5 kids, ranging from fresh-out-the-womb twins to 6 years old and she had NO problems. We believe she even managed to create a new helmet sauce for her daughter’s head. Combine ground beef, jaew (or Worcestershire if you don’t have ANYTHING else, shame on you), garlic salt, and chili peppers in a large bowl. Mix WELL. Form 8, thin patties from the beef. Your patties should be slightly larger than a cheese-slice. An authentic Philadelphia cheesesteak normally has American, Provolone, or Cheez Whiz, but use whatever doesn’t trip off anyone’s lactose intolerance. 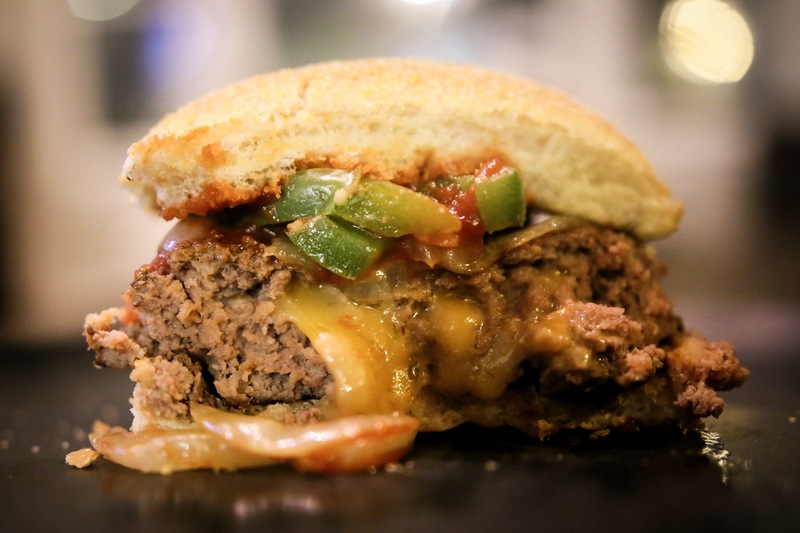 But take a slice of that cheese (or about a spoon of Cheez Whiz) and cut it into quarters, stack it, and put it between two patties. Pinch the edges to seal the cheese inside and repeat for as many burgers as you’re making. Using medium heat, cook it like a regular burger, until brown on the outside and no longer pink on the inside, unless you prefer it medium rare. You should cook the bottom approximately 4 minutes, flip it, poke a small hole in to let the steam of the cheese escape, then cook the other side another 4 minutes. This is experimental so it might take a few tries before getting it right. At this point, you can add another slice of cheese on top if you like. We don’t like pretentious buns on our burgers at Little Laos on the Prairie, but use whatever, since it’s highly unlikely you have access to an Amoroso burger roll. Sauteed onions and green peppers can be added on top, or in some cases mushrooms. Note that when you take a bite into a Jucy Laocy, the cheese is going to come out very hot and gooey, so be prepared and have napkins handy nearby! And if you MUST give a nod to the Patriots, go ahead and stick a little American flag on the bun before you serve it to someone. There you have it! What recipes are YOU making for this year’s Super Bowl, Lao America?